Ms. Celiac Says...: Time For Mrs. Crimble's! I just recently discovered the UK brand, Mrs. Crimbles! I have tried their Gluten Free Coconut Macaroons and their Gluten Free Chocolate Macaroons! 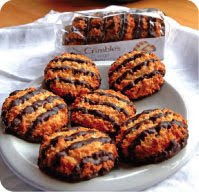 The Chocolate Macaroons (photographed to the right) completely remind me of the Girl Scouts' "Samoa" cookies, which were always my favorite! The gluten free cheese bites are available to purchase at Ms. Celiac's Market! Let's Grab a Bowl of Cereal!